Some design work had progressed in parallel with previous negotiations. It re-started in late 1982 when Mark Bertram visited for a full reassessment of the embassy’s accommodation requirements. The intention in the early 1980s was that the design for the residence on the Voyevodina site should be commissioned from a consultant architect and for the offices and flats on the Smolenskaya site, with its numerous security implications, from an OED in-house team. Kenneth Campbell, an exceptionally able in-house architect was appointed project architect. His outline design (the first design) worked well and looked good. It ranged residential accommodation for about thirty UK staff on eight or so floors along the river front of the site, with a corridor behind, running parallel to the river, that also gave access, on its other side, to a hall, office block and ancillary accommodation. The appearance was slightly crystal-like to help the building to hold its own between the large sombre Soviet blocks on either side. In early 1986, the FCO convened a Moscow design panel to advise on all design and presentation aspects of the project. HRH The Duke of Gloucester, himself an architect, was its chairman and among its members were John Partridge and Andrew Sebire, both highly regarded consultant architects, and several senior commercial advisers and officials, including the chief clerk, Sir Mark Russell, and the ambassador in Moscow, Sir Bryan Cartledge. The Duke and most of the panel paid a familiarisation visit to Moscow in October 1986. On return, the panel turned its attention to some pressing architectural issues. As the project became more real, interested departments began paying more attention to how the building should be and the brief had in consequence changed since design work started. With Campbell soon to retire, and resources no longer available to sustain in-house design work on such a large project, the panel was keen to bring a major private sector architectural firm into play as soon as practicable. It proposed that OED should discuss the project, with a view to a possible commission, with four major London practices with slightly different architectural outlooks: Norman Foster, Philip Dowson of Arup Associates, Chapman Taylor, and Ahrends Burton and Koralek. OED visited the principals in their offices and Keeble then chaired a fuller interview with each. Foster pulled out because he was too busy, Dowson was evidently wary and Chapman Taylor appeared more interested in the business than the problem. Ahrends Burton and Koralek seemed ideal from the FCO’s viewpoint: supportive, rationalist, humane, and young enough to last through what might prove to be an unusually lengthy commission. They were accordingly appointed and briefed in mid-1988. For the selection of a design, as distinct from an architect, for the residence on the Voyevodina site, the panel decided that a two-stage open competition should be held. The Treasury agreed that the guideline area of 880 sq.m. 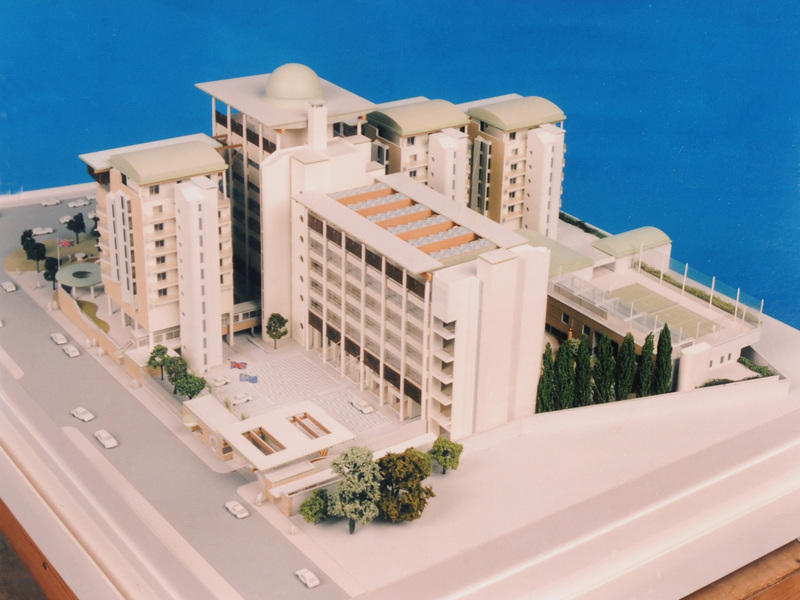 for this most senior grade of residence should be increased to 1,200 sq.m. to suit the particular requirements of Moscow. Expressions of interest in response to advertisements in the architectural press in March 1988 were received from 112 architects, fourteen of whom were interviewed by John Partridge and others in June and reduced to eight. OED took senior members of these short-listed practices to Moscow to show them the site, see the present residence in operation and discuss future requirements with the ambassador. Their eight schemes, of great variety and distinction, were submitted in October 1988. The Duke of Gloucester and other assessors took them to Moscow for inspection on the ground. OED showed all of them to the Moscow planners, who pronounced none of them unsuitable. The Duke of Gloucester chaired the assessment panel that comprised the chief clerk, the ambassador, John Partridge, and Andrew Sebire, with OED as secretary. After a wide debate, it came down to a choice between Julian Bicknell’s skilfully arranged, beautifully drawn, neo-classical proposal and Allies and Morrison’s inventive, elegant and modernist one. At the end, the two senior diplomats outlined the virtues of the Bicknell scheme and the two respected architects those of the Allies and Morrison scheme. The Duke, torn between the establishment and his profession, had doubtless seen this coming. OED’s view was two-fold: competitions should ultimately be decided by the client, provided that it was well-informed, and not by architects, however eminent; and, given that the FCO would probably find a way of not building what it did not like, it made greater managerial sense to opt for the scheme more likely to be built. The Duke did a masterly summing-up, and left it until the end to plump for Bicknell. “No single scheme could unanimously be acclaimed as outstanding and the winner was chosen by a majority decision. The project was never executed. Margaret Thatcher and Mikhail Gorbachev decided in principle in 1990 that the ambassadors should remain in their present houses in both London and Moscow. Richard Burton took the lead for Ahrends Burton and Koralek, with Jeremy Peacock as his project architect. OED’s project manager was Clive Newey, and Ove Arup and Partners were commissioned as structural engineers, YRM as mechanical and electrical engineers and Hanscomb as quantity surveyors. The design that emerged (the second design) was in many ways a literal and graphical response to several strict requirements of the brief. The Russians insisted on a 30-metre height limit; security requirements insisted that the offices be as near to the middle of the site as possible; and the construction strategy envisaged by the draft Building Agreement was for the Russians to undertake the main building work (and doubtless riddle it with bugs) and for British labour to fit out the offices after the Russian contractors had left site (and disinter them). The scheme that Burton proposed was two parallel lines of outward-looking flats, at right angles to the river, with a huge covered atrium between them. In this atrium, British contractors would later erect a prefabricated four storey office building imported from the UK. 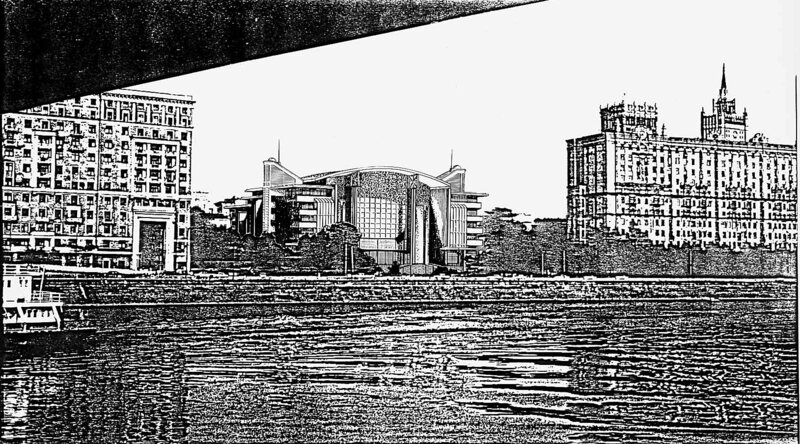 This scheme was shown to FCO Ministers in January 1990, and to the Moscow City Architect, Leonid Vavakin, and the architectural panel that advised Moscow City Council, in summer 1990. All parties agreed that the scheme was an enterprising and acceptable response to a curious problem but there was alarm in London at the exorbitance of the estimated cost, about £160 million. While the implications of that level of expenditure were sinking in, the Cold War was beginning to thaw and the pressure to go forward with such an ultra-high security solution was reducing. Andrew Wood became chief clerk at the FCO in 1992: he had served in Moscow twice in his career and may have expected to go back as ambassador. He well understood the looming office problem in Moscow and did much to clear the way for its solution. 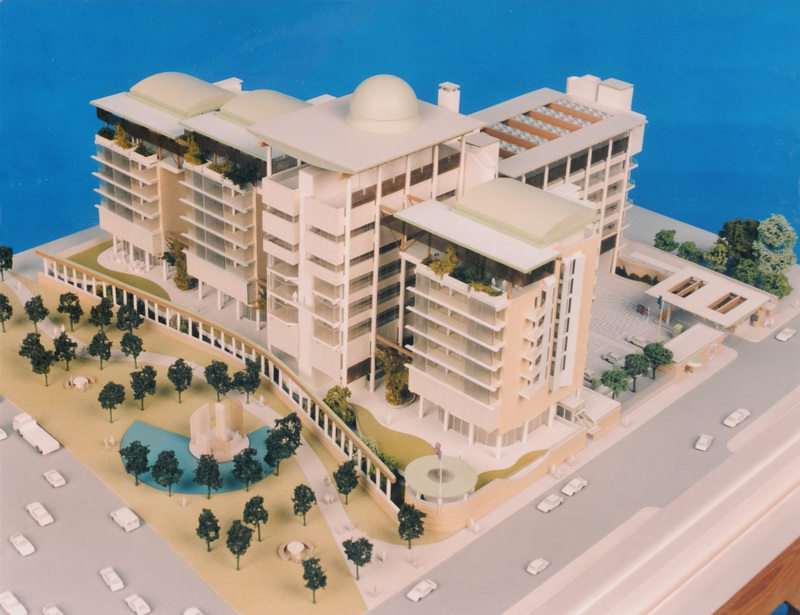 The design team was tasked, through a feasibility study of 1992, to explore an entirely new design which was developed into firm outline proposals in early 1994. As the project became a more normal one, and as FCO Ministers were content for the new design to be taken forward, the Duke’s panel wound itself down. It was decided at that stage to appoint a project manager to lead the team of professional consultants and carry the main load of interfacing with the innumerable bodies involved. Hanscomb, the quantity surveyors, were appointed and spawned The London Group to carry out the project manager role (and to keep its distance from the rest of the practice). This arrangement left Burton free enough to be a fully committed design team leader. The new (fourth) design comprised three 8-10 storey blocks of flats and one of classified offices on a podium along the front of the site, with cars and plant rooms beneath, and connected by a long gallery running north-south beside. The classified offices block had an extension reaching eastwards back from the river containing the unclassified offices, with entrance hall and exhibition area beneath. Where this east-west axis crossed the gallery was the crux of the site and of the design. Ancillary accommodation was grouped in the north east corner. It was an admirably clear, yet subtle, disposition of functions, easily understood, and it appealed to all in London. The layout proved strong enough, and Burton’s detailed planning ingenious enough, to cope with the many additional demands that came to be placed on it. 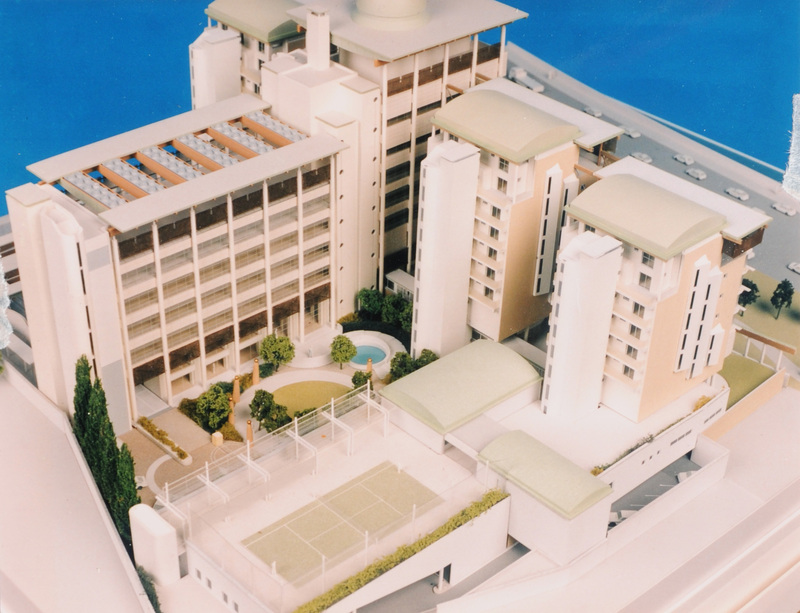 The main corridor, the spine of the building, served the offices, the 31 flats and the sports and leisure amenities without compromising the security of any of them. It was rather surprising that the first and only time in the diplomatic estate that staff families could share such a main route with office staff was in this most secure of Posts. This solution, far from being a requirement of the brief, was a felicitous choice by the architect in partial response to Wood’s belief that Moscow was still a grim and not particularly healthy posting for most families and that encouraging human contacts and physical exercise was a thoroughly desirable outcome. With Treasury approval of £70 million for the 20,000 sq.m. 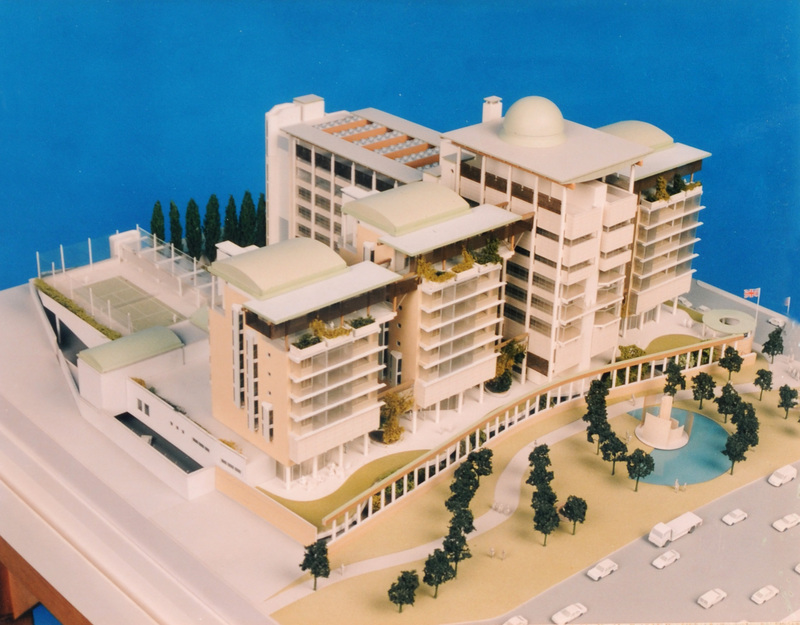 project in May1994, it was time to seek planning approval in Moscow. 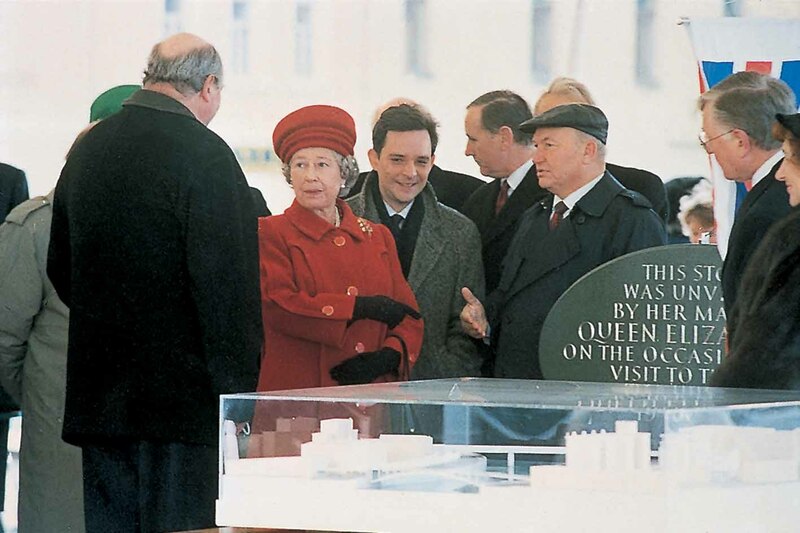 The hope was that it could be achieved in time for HM The Queen to unveil a commemorative plaque on the site during her State Visit in October 1994. Discussions with Vavakin started promisingly but were halted in July 1994 when he reported that his colleagues required certain changes. Vavakin visited London in early August to discuss these with Burton and OED. What was evidently required was a more monumental and less ‘frivolous’ appearance. Burton, with Patrick Stubbings who had by now succeeded Peacock as project architect, worked fast to bulk up the appearance of the building by raising the podium, increasing the building heights, eliminating some curved roofs, and other adjustments. Three weeks later, Burton and OED called on Vavakin in Moscow to show him the results, as a result of which the Moscow Architectural Council gave the scheme its approval in September 1994, as did the Foreign Secretary, Douglas Hurd. Nonetheless, when the Queen unveiled the plaque on 4 October, the Mayor of Moscow, Yuri Luzhkov, explained to her that the city architects were still not content with all the details of the design and would no doubt revert to the issue in due course. 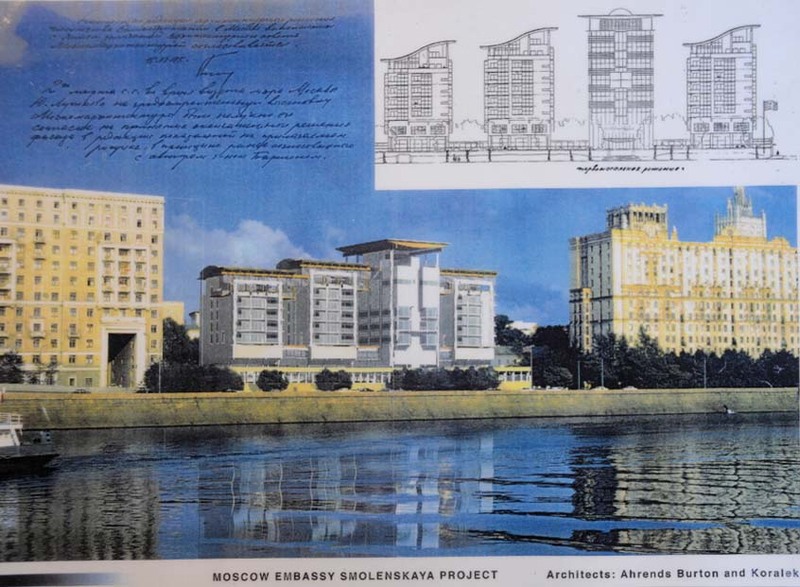 Luzhkov was known to believe that the front elevation bore too close a resemblance to a block of ‘holiday flats in a Black Sea resort’ to be appropriate for Moscow but it was a surprise that he brought the matter up on this occasion. Meanwhile, design development and working drawings were going ahead in London. The frontage design issue was not finally settled until February 1995, when Burton and OED called again on Vavakin in Moscow. They were surprised to notice, and thereafter totally ignored, a Russian architect’s drawings pinned up on the wall of Vavakin’s office of how the British embassy should look. Fortunately, Vavakin ignored his staff’s proposals too. Burton won him round to his own latest proposals, which included balcony structures that connected the blocks visually at high level, and described the intended materials in terms of their Russian relevance. Vavakin agreed that he would try and persuade Luzhkov when he saw him that afternoon. Burton and OED were summoned to Vavakin’s office the next morning and were relieved to be handed a signed copy of the approved drawing. 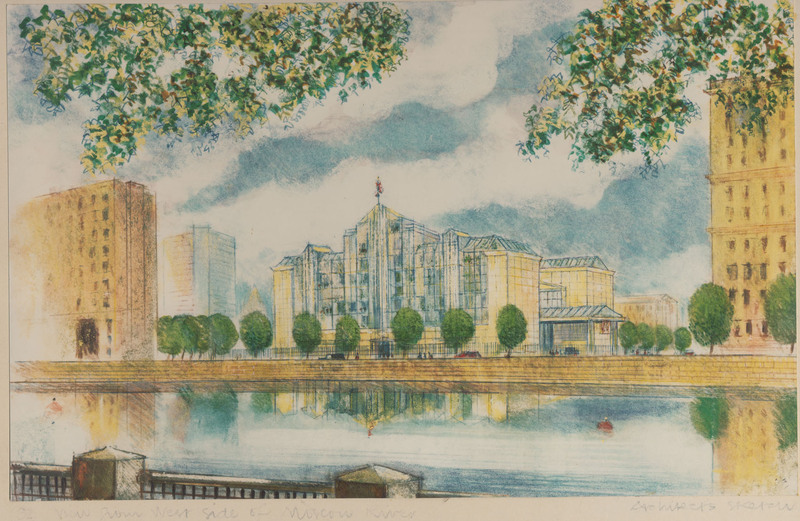 The first design, 1985, by Kenneth Campbell: river frontage. Ken Campbell’s sketch of the rear frontage of his 1985 scheme. The ultra-high security second design, by ABK 1989. The intermediate third design, by ABK 1991. 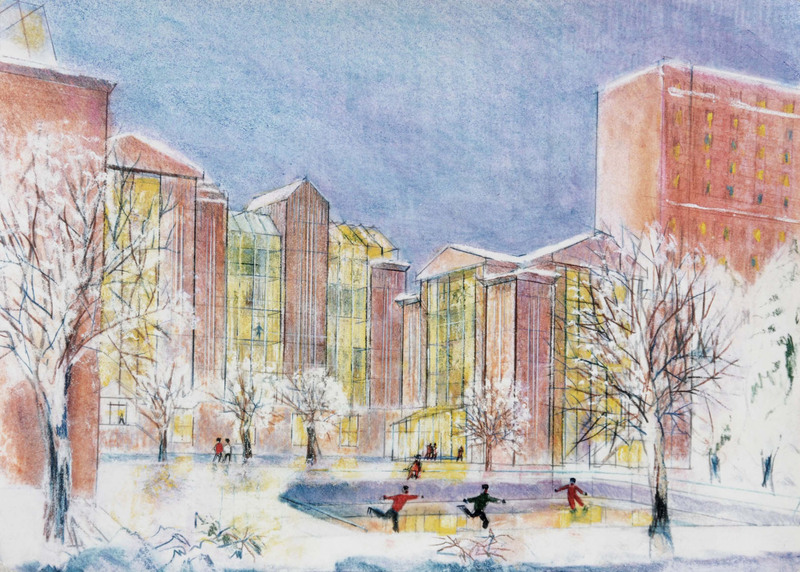 The fourth, and final, design by ABK, 1994, with the Moscow City architect’s handwritten approval of the scheme. 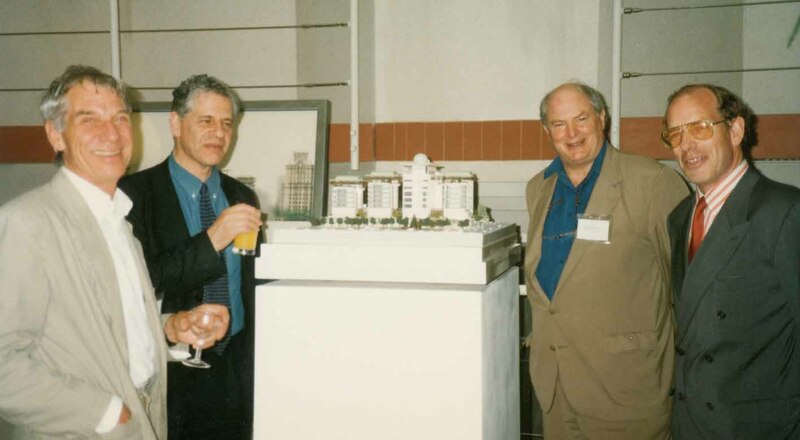 ABK (from left to right) Peter Ahrends, Paul Koralek, and Richard Burton, with Mark Bertram, 1997. The tented structure beneath which HM The Queen unveiled a plaque in October 1994. The Mayor of Moscow and Her Majesty, after she unveiled a plaque at the site of the new embassy. Richard Burton is at left, facing The Queen. 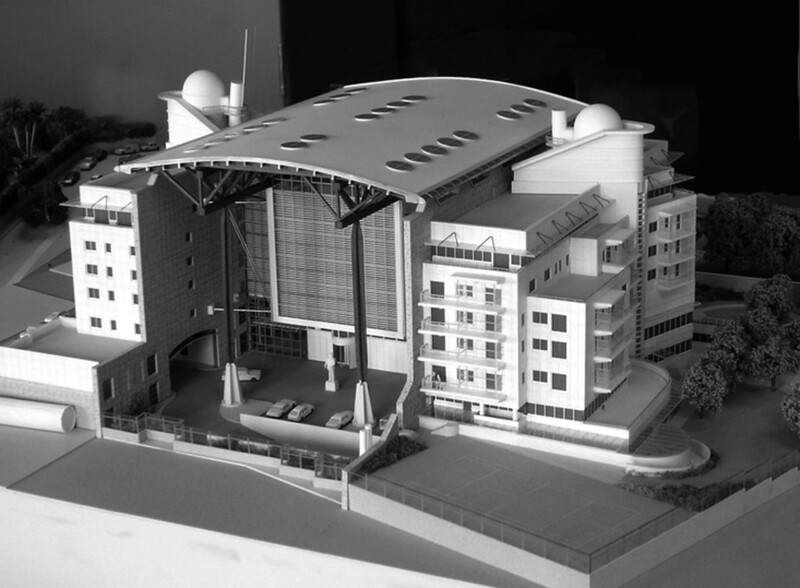 Model from the south-west, with the entrance off Protochny Street at right. 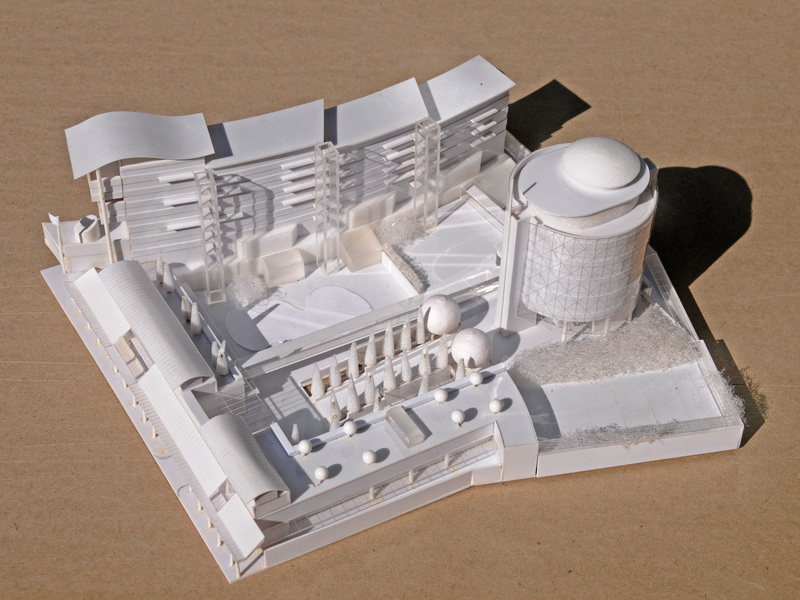 Model from the south-east, with the entrance in the foreground and paved forecourt behind.